Australia is a home to so many iconic destinations so why not start with some of the favourites. All our favourite destinations include local attractions, guides to upcoming events, nearby hotels and accommodation and even where you can grab a bite to eat. Australia is a land of heaven and dreams. From the holy legends of the Aboriginal Dreamtime, when the great spirits conjured the rainforests, coral reefs and scorched red deserts, to armchair travellers who describe Australia as their destination place, the Land Down Under deserves all the hype. The world’s largest island and smallest continent. Australia is almost the same size as the United States but with a population the size of New York State and some of the unconventional wildlife on the planet. Australia is also a land of spectacular beauty and staggering contrasts. Along the seashore, you can explore vibrant multicultural cities, vast sand islands, ancient rainforests, and one of the planet’s most awe-inspiring natural wonders – the Great Barrier Reef. In the other side, rugged national parks and red-earthed deserts offer the ultimate in adventure travel. The island of Tasmania is as intimate as it is beautiful. Its gorgeous capital city, Hobart, is home to one of the world’s most interest art galleries, while northern Launceston is one of the few cities on the planet to be wrapped around a gorge. You can drive anywhere in the island state and you can go from beach-lined coasts to World Heritage-listed mountain areas in just a few hours. 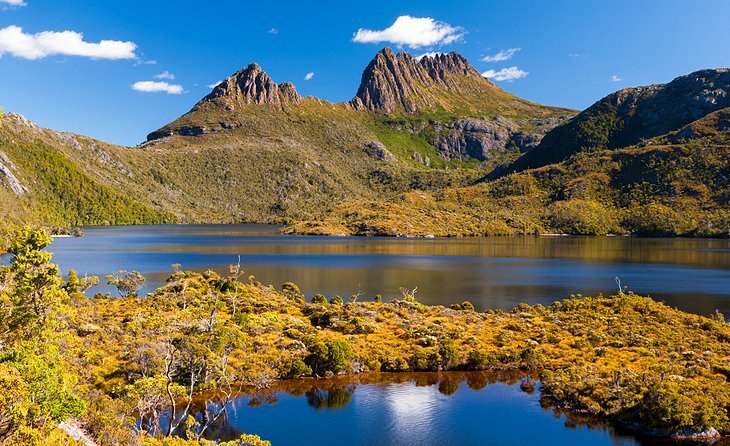 Tasmania blows well above its weight when it comes to natural beauty. Trekking opportunities range from short, waterfall-punctuated forest trails to multi-day wilderness epics with no one else in sight. In Tasmania, you can explore the island’s craggy coastlines and wild rivers by kayak, raft, yacht or cruise boat. Tasmania native wildlife is ever present: spy Tasmanian devils after dark, share the Southern Ocean swell with seals and dolphins or watch penguins waddling home at dusk. Here, you can enjoy the weather as well as adventures activities. The Perisher Valley is located in the Kosciuszko National Park a 35-minute easy drive from Jindabyne (when it snows the road is cleared to the main car-park). At a base of 1,720m above sea level, most Perishers accommodation is on the snow. The resort’s highest ski lifted point sits at 2,034m. General facilities and services at Perisher in winter include: over snow transport, accommodation, snowboard and ski hire, snowsports schools, ski patrols, snowmaking, lockers and ski storage. Shops, restaurants, cafes, bars, ATM, post office, supermarket, childcare, police and medical centre are available. The Perisher Valley area and Blue Cow are connected by the Skitube, with all of the four resort areas interconnected by ski trails and chairlifts. Perisher has a total of 47 lifts, a downhill skiable area of 1,245ha with 54ha of snowmaking area and 104km of marked cross-country trails. In the summer majority of Perisher Valley’s facilities are closed. However, the area is still a popular destination for bush-walkers, mountain bikers, cyclists and those after a relaxing getaway with spectacular alpine views. Jindabyne is a perfect destination at any time of the year in the NSW Snowy Mountains. On the beautiful Lake Jindabyne, the scenic town offers outdoor adventure, gourmet delights and vibrant nightlife, and is a great base near the snowfields in colder months. Adventurous tours include mountain biking, bushwalking, fishing, kayaking, horse riding and helicopter joy flights around Mount Kosciuszko, Australia’s highest peak. The Backcountry offers alpine guided tours for skiers and snowboarders beyond the snow resorts in the snow-covered wilderness. Lake Jindabyne is popular for water sports. The waterway is full of or swarming with fish and is part of the Snowy Mountains Scheme, Australia’s greatest engineering project that creates hydro-electricity. The city was relocated before the old township was flooded in 1967 to create the lake. You can hire all kinds of equipment in Jindabyne for your adventure holiday. There are shops selling all the essentials too, from kit to fashion. You’ll find plenty of accommodation options in and around Jindabyne, from camping and caravanning to cottages, chalets, apartment, motel, and eco-resort. Make your way to Dinner Plain and nestle in among the snow gums on the high plains of the High Country, enjoying snowy adventures in the wintertime and outdoor fun in the warmer months. Staying in a luxury accommodation inspired by the historic cattlemen’s huts of the surrounding region and feel a million miles from city life. Strive out a relaxing sanctuary from nearby Mount Hotham during the winter months and feel the difference. Ski trail around Dinner Plain’s meandering cross-country trails and gentle downhill slope with beginners’ Poma lift. The village is surrounded fully of snow and make your day with a dog sledge tour across the mountain. Learn a ski lesson to get the basics down and then hire your gear and make your way to Mount Hotham ski resort, just 10 kilometres away. This village is completely surrounded by Alpine National Park, setting the scene for spectacular sights. In the National park, you can enjoy guided walks along with horse riding, bird watching, canoeing and cycling. The Dinner Plain snow park provides the perfect place for kids and beginners to learn how to toboggan and snow tube, or enjoy ski lessons on the gentle slopes. Night skiing in snowpark on Wednesday and Saturday nights. Head to Hotham Alpine Resort for adventurous located 10 mins drive from Dinner Plain. Here you can enjoy downhill and cross-country skiing, snowboarding, tobogganing, snowshoeing and sledge dog tours.